Given clear skies, you cannot miss seeing the waning crescent moon with the blazing planet Venus before sunrise tomorrow (Saturday, January 29). The moon and Venus rank as the second and third brightest celestial bodies in all the heavens. The sun, of course, ranks as the brightest celestial body of them all. Look into the east or southeast sky at or before dawn to enjoy the beautiful morning tableau. Almost everywhere around the globe, the moon and Venus will rise 3 hours (or more) before the sun. In fact, if you are up an hour or more before sunrise, you will likely see the ruddy star Antares as well. However, this 1st-magnitude star –the brightest in the constellation Scorpius – pales next to Venus. Venus outshines Antares by over a hundredfold. Our chart shows the morning sky for about one hour before sunrise in North America. The sky will look similar at this hour at northern temperate latitudes all around the world, except that the moon’s position relative to Venus and Antares will look somewhat different. 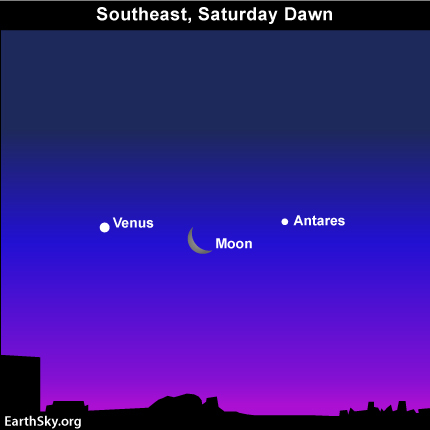 In North America, we will see the moon midway between Venus and Antares. As seen from Europe and Asia, the moon will appear closer to Antares. In much of Asia, the moon and Antares will be close enough together to fit within the same binocular field. At temperate latitudes in the southern hemisphere, the morning line-up crosses the sky more vertically than horizontally. However, no matter where you live worldwide, look for the moon, Venus and Antares to light up the eastern sky in the wee hours before sunrise! Site contents copyright © 2019 Recorder Online	except as noted. All rights reserved. | 88 queries in 2.308 seconds.